It is believe that Catholic nuns at the Jeronimos Monastery of Belem, in Lisbon created them, and after the monastery was closed in the 1820’s, a famous bakery in the area picked up where they left off and started to make them. They are so popular, that people will literally wait hours for them. Especially if they get them right out of the oven, when they are warm so they can sprinkle them with cinnamon and powdered sugar. 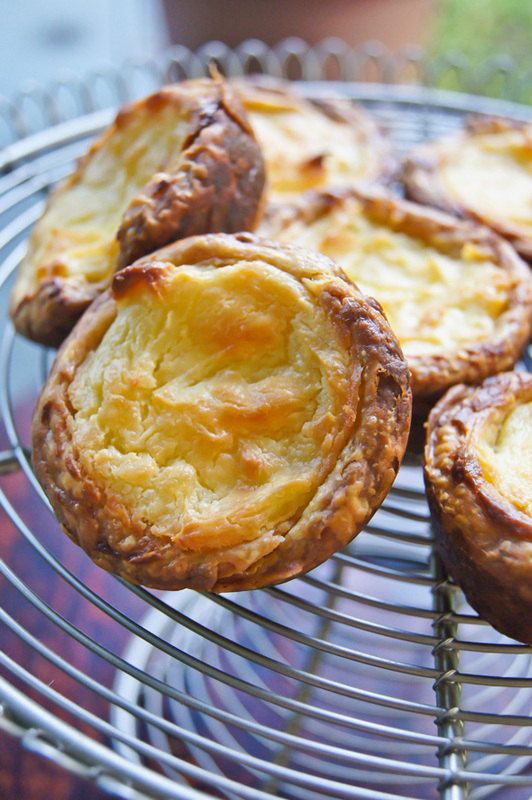 There have been many imitations, which bear the name of Pasteis de nata – custard tarts. And Mr. Leite provides the link to his adaptation of Alfama’s Restaurant recipe, which got thumps up from his friends. I have it on my list to try it. In the meantime I journeyed down memory lane and found the original paper where I wrote the recipe that the baker gave me in Brazil. 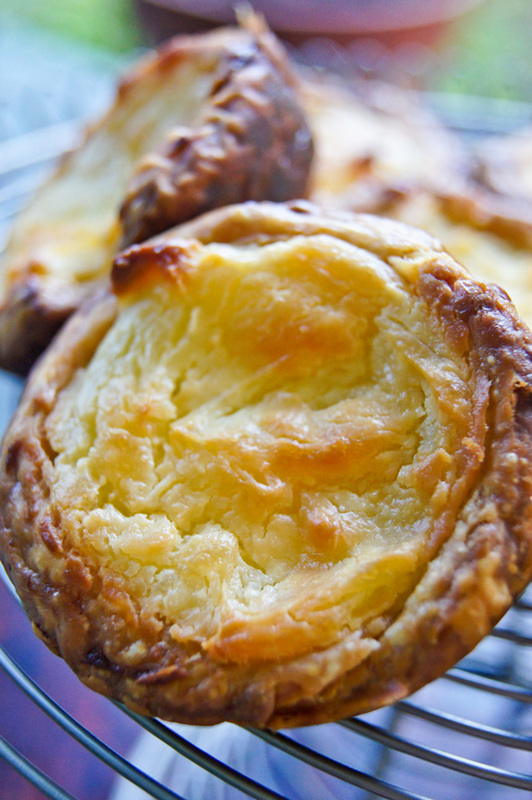 And since I never had the original Pastéis de Belém, I will have to be happy with these – which I dare say, are great impersonators. Combine the milk, cream and lemon peel and if you are using, the vanilla pod and seeds in a saucepan and bring to a slow boil over medium heat. Once it has reached that, turn it off, cover and let infuse for 20 minutes. Remove the peel and vanilla pod and and put it aside. In a bowl, whisk the egg yolks, sugar and corn starch. Gradually add the warm milk until smooth. Return it to the saucepan and over medium heat cook, stirring constantly, until the mixture thickens, this will happen pretty quickly. Don’t let it boil. Remove it from the heat and continue to whisk - it will continue to thicken, add the vanilla extract (if not using fresh vanilla bean) and once the custard is glossy and smooth transfer it to a bowl. Cover with a damp kitchen towel, to prevent skin from forming. Leave to cool. 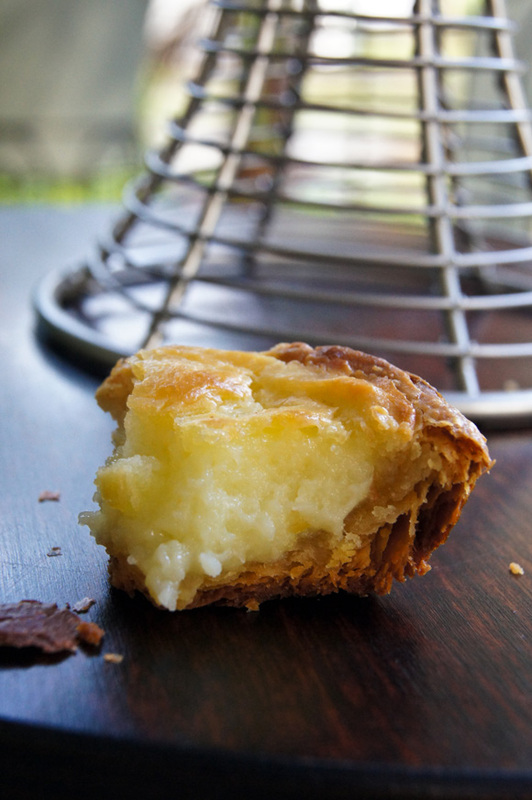 Using butter, grease a 12-hole muffin mold. 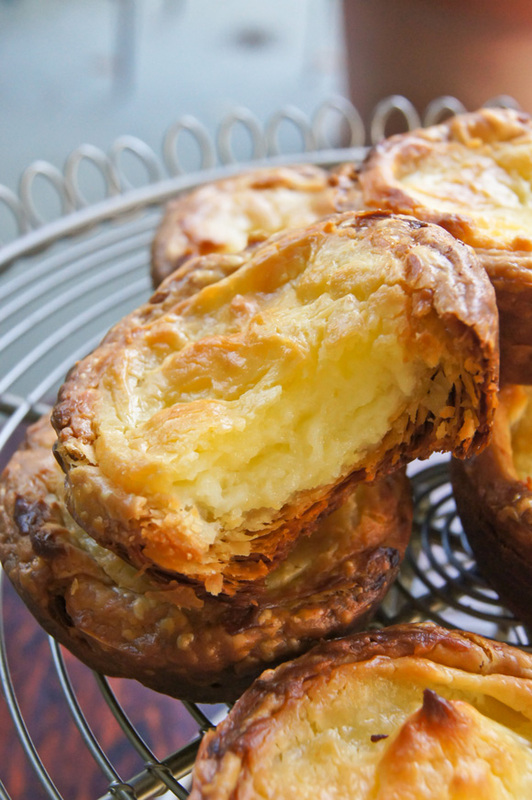 Cut-sides up, using your thumbs press down in the middle of the pastry round. Push down and out with your thumbs. Place on the mold and smooth the dough up the sides and along the bottom of the mold. Best served when they are hot or warm. Now watch them disapear before your eyes.